My friend Becky from Week99er came over recently to borrow a couple of my slow cookers. You see, she has an ABUNDANCE of pears coming from her pear tree so she brought me a bag full! 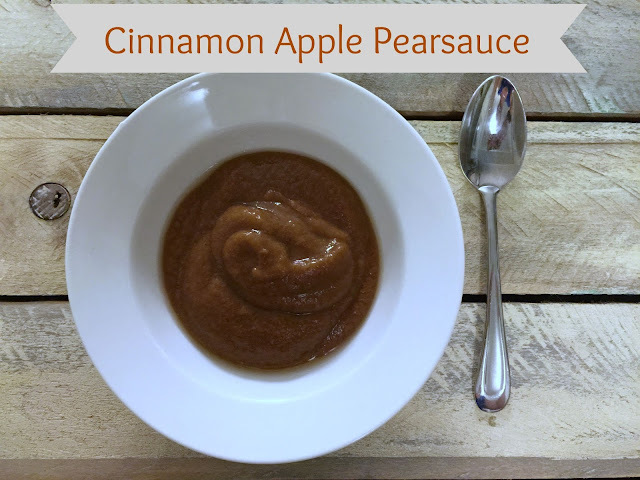 I let them ripen on my counter for a few weeks and then turned them into this amazing Cinnamon Vanilla Pearsauce! YUM! Not only is this pearsauce SUPER easy and SUPER flavorful, but it's full of nutrients and fiber because I left the skin on. You can take the skin off if you wish, but it really isn't necessary! Place all of the pears into your slow cooker, then add in the raw honey, cinnamon, vanilla and water. No need to stir! Just set put the lid on and set your slow cooker on LOW for 7-8 hours, or on HIGH fro 3.4-4 hours. Test doneness with a fork, then use an immersion blender to make it as chunky or smooth as you like it!